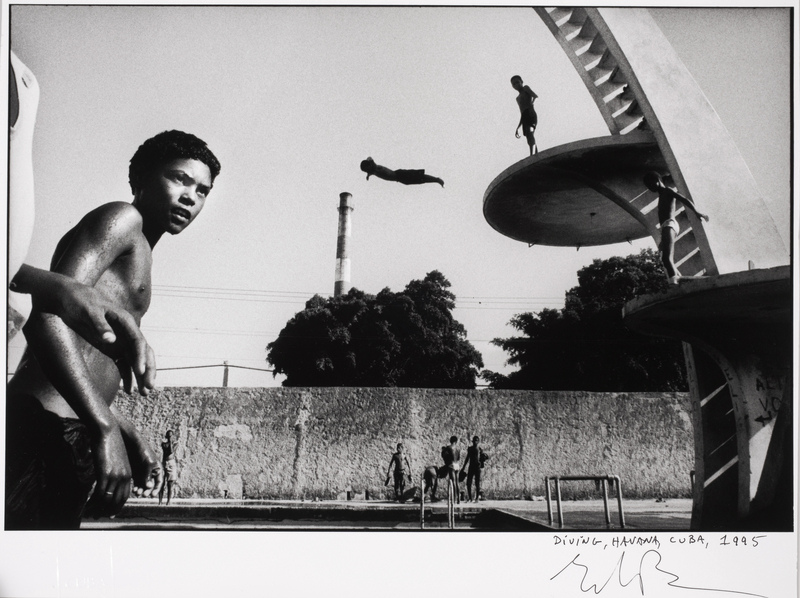 I wanna share also in this blog my interview with Ernesto Bazan, realized for Hyde Park Photography Magazine. “I had strongly desired Cuba for many years in the same way you desire a woman you meet and are not able to get out of your head. 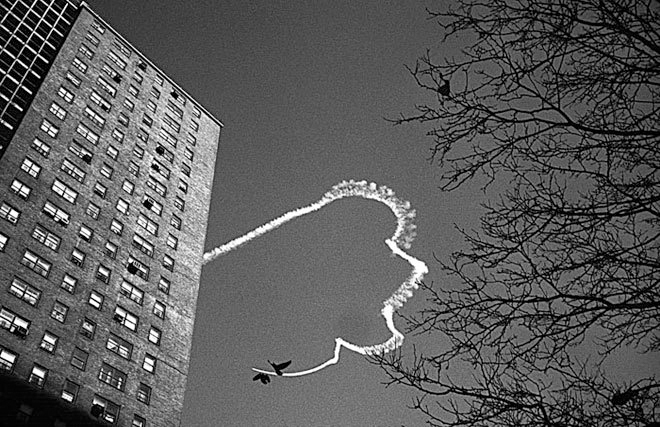 I am pretty certain to have lived there in another life” Ernesto Bazan wrote in the pages of his diary. In Cuba he found the woman of this life, Sissy, whose relationship brought to their twins Pietro e Stefano. Today Ernesto Bazan no longer lives in Cuba, a country he was forced to leave in spite of his own will, but his relationship with Cuba as yet remains absolutely deep and indissoluble, even from Veracruz, Messico where he presently lives. Thanks to his love for the isla, Bazan has won numerous international awards like the W. Eugene Smith Fund, considered as the Oscar of the world documentary photography, the first prize in the daily life category at the World Press Photo awards, and a fellowship of the prestigious Guggenheim Foundation. For the forthcoming publication of his last book Al Campo, which describes the daily proceedings of his Cuban farmers and friends, a work lasting 5 years, he has accepted to be interviewed by HYDE PARK PHOTOGRAPHY. Hi Ernesto, after Bazan Cuba, another book produced on your own. Would you like to talk about it to the readers of HYDE PARK PHOTOGRAPHY? Al Campo is my first book of colour prints focused on the Cuban countryside and my beloved farmer friends. I have again had the extraordinary privilige to rely on the help of my students. The editing as well as the choice of the sequences in the book and the book cover were done by a combined effort between my students and I. They also helped me to finance the book by pre-purchasing several copies of the limited edition, like they did with Bazan Cuba. Eight of my students even accompanied me during the book’s official presentation, which took place in Verona. Is Cuba different if seen by “Cuban eyes”? I believe any country that is seen from “the inside” is more intimate in the end. I had the possibility to live on this island, bright and sad at the same time, for a long period of my life. Fourteen year are many. I’m glad I did it and would do it again tomorrow. The most interesting aspect for me, photographer for profession, was to not worry about what I would have done with my photographs. I just loved getting lost on the Cuban streets, meeting new people, talking to them, getting to know them, play dominoes with them, and even taking photographs of them. Now, the work I’ve done slowly begins to take shape. I believe that there is no better way to work than succeeding, with the passing of the years, to bend, if not break even, that solid almost unbreakable glass that often separates us from our subjects. I think I’ve tried having married a Cuban woman and with twins born in Camaguey. You now live and work at Veracruz. But, I imagine you still follow Cuba at a distance. Do you think the island is always the same or has it changed? How have the last political events with Fidel Castro, more and more sick and tired, changed the people of the island, if they have at all? Since I was forced to leave the island in 2006 I don’t think Cuba has changed a lot nor do I think that much will change in the years to come. People continue to wait, tired and desperate, for something to happen. But for the time being the only thing possible is to escape or to continue to wait while you see your life, the best years of your life, flowing rapidly in front of your eyes. You lived very close to the campesinos of the island, becoming friends with them. What would you prefer would be highlighted of this work? The simplicity, ancestrality and poetry of their daily life, which is still deeply and intimately rooted to an ancient world. I adore working with a panoramic camera. It has radically changed my way of seeing and feeling for life. I started using this kind of camera the last five years I lived in Cuba. I have recently gone back to all those pictures I had done, which I had almost forgotten. I am now trying to understand where to fit them in place. Your activity as a photographer is linked to the organization of workshops. 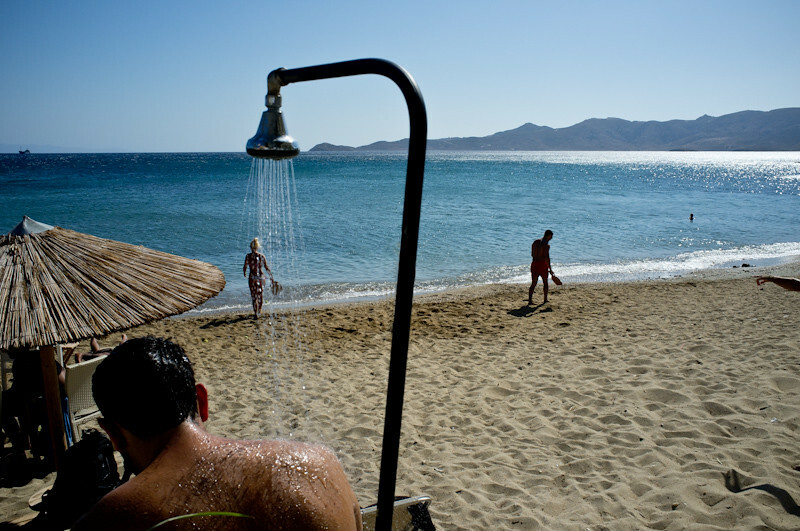 To quote Rubèn Pax, Mexican photographer: “I like to give classes and what I live on are classes. I live on photography, and for photography”. I fully agree with the words of Rubèn Pax. To have created my own workshops I think is one of the most important achievement of my whole life. My personal and professional life has changed radically thanks to teaching, and thanks to my students, it has given a new impetus to my work as a photographer, my books are maybe the best example of this new way of working. In the last ten years, thanks to my workshops, I have had the incredible fortune to be able to abandon my work for magazines and to dedicate all my efforts to help my students in their growth as photographers leaving me enough time to shoot photographs only for myself. This freedom is priceless. How is life at Veracruz? At Veracruz I live happily with my family. It is still a provincial and sleepy little town, developed on a human scale. One of my best friends, Juan de la Cruz, lives at Veracruz. He is a fantastic photographer, and great expert of software like In design and Final Cut Pro. He was of great help in impaginating my books and in creating the audio-visual interface for Bazan Cuba and for the videos we prepared for the fund-raising on the platform of crowfunding Kickstarter. Once the work is completed, in the following years, we are thinking of publishing the personal work on Mexico Juan has been carrying out for the past years with the BazanPhotos Publishing. An essential aspect of my existance. If you have to choose only one camera to bring with you, which one would you choose? An analog camera with a 35mm lens. Exclusively analog. I like being a dinosaur. Lately, strictly black and white. But I hope to resume taking colour photographs. Which is your next project in photography? Most probably the panoramic work in black and white carried out in Cuba. What would you say to who would like to become a professional photographer? To roll up their sleeves, breathe deeply and persist for a lifetime without losing hope, taking pictures that are intimate and revealing and that, at the same time, talk of the subjects depicted and of you the photographer. 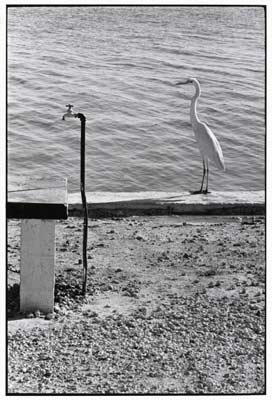 You can see Ernesto Bazan work on his site. I always carry a camera with me. A great street picture you can find anywhere, then we always have a camera with us. The technology comes to us with cameras more compact and transportable. No matter that it’s a mirrorless, an old 35mm or an iphone. It will be obvious to say but the best camera is the one that uses more. The instances don’t repeat themselves in street photography. Be ready to shoot is a commandment in our genre. So our camera settings should be ready in a few seconds to capture every situation: zone focus, hyperfocal, program can be effective solutions. If our camera is slow to start we can consider to keep it turned on: mandatory in this case at least one spare battery. Also a wrist strap is an ideal solution to be ready to shoot. It is a matter of personal safety, but also not to draw attention to us. I have chosen Think Tank Photo and in particular the series Retrospective. I think is the perfect choice for street photographers. Sometimes we can see great compositions but the subjects are not so strong. For example it is not enough, in my opinion, a photo in a arcade with light and shade without subjects interesting. We must strive to find characters or special postures, really interesting situations. 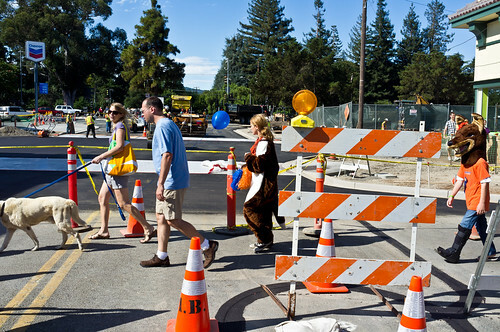 Street Photography is not a safari. So forget those zoom lenses. We must be in the scene and a telephoto lens does not allow it. And then you will look even more conspicuous in public holding a huge zoom lens. If you still have doubts, ask yourself why all the great reportage photographers were using or use normal or wide angle lenses. Using a wide-angle prime lens (as mentioned in the before point), you will be forced to get close to your subjects. 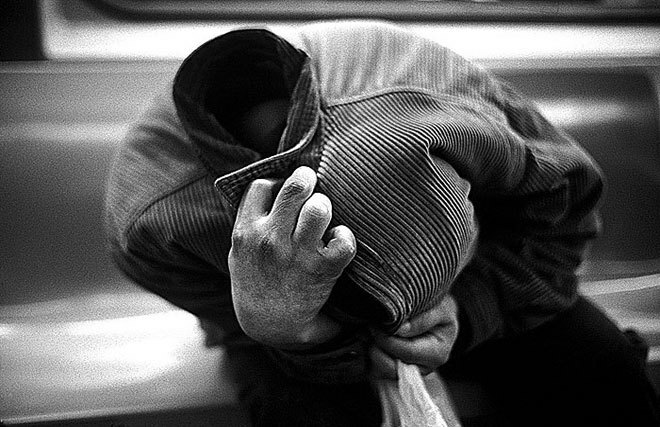 Street Photography is mental, emotional and physical involvement of the photographer. We can not think of doing good street photography if we remain distant. As said Blake Andrews in the interview published in this blog: If you walk around thinking you’re not going to see anything, it’ll become a self fulfilling prophecy. You won’t see anything. But if you walk around with the expectation that a photo can be anywhere, that one will pop up around the next corner, you will see things. The environment is exactly the same in both cases. It’s the mental outlook that matters. Every single time I go out shooting I see the potential for at least one world-class photo. They are always out there. But being in the right mental state to capture them is sometimes difficult, especially because street photography can involves long periods where not much happens. So developing that faith and keeping it with you at all times is important. The world will provide if you trust it to. And don’t forget to smile! With a smile, people usually respond with a smile! 8. Interesting situations, more than one single shot! When the situation and the subject are interesting when you can make more shots. Maybe changing the position and viewpoint. To be a street photographer is be extremely attentive to the frenetic activity in public spaces. The situations change sharply even in the same place. While walking down the street you will come across a variety of events,acts, postures, gestures, scenes, expressions, subjects, etc. There is a multitude of possibilities in the street for the photographer but we must be alert. Remember that photography is above all to observe. Street Photography is capturing the activities happening by the roadside, street concerts, traffic signals, billboards, hoardings, fences, trees, birds, cats, dogs, similarities and associations, the vertiginous heels of a woman, a man smoking a cigar while waiting for the tram. To quote Bruce Gilden if it smells of the street is street photography. Would I have problems taking pictures in the same situation a person dear to me, my mom or my wife for example? Respect of the subject should be the basis of our pictures. If you really want to represent some physical defect, worry that the subject is not recognizable. And remember that only if we photograph with respect will do good photos. Inspiring. The best definition for Andreas Paradise, i think. His street photography deeply attentive to the search of lights and shadows, very often has the ooooh effect, as it should be a street photograph. Hi Alex, street photography is for me a way not only to see but also to feel the fellow people, the world, the everyday reality, the small details which engulf us in public places but which I couldn’t see before starting to shoot in the streets or before starting to enjoy the good sp of other photographers. Street photography is a way to discover an invisible world, a parallel odd world which coexist with the boring one we all know. And the photography of Andreas Paradise what is looking for? I could say that my photography is looking for my truth. My truth of how the world is or could be. But of course this truth is a big lie after all. But don’t forget that photos say true things with lies. I associate above all the word “strong” with your images. There is a lot of tension in most of your shots. Do you think this is determined more by the composition or content of the image? For my taste “strong” is a photo which encapsulates an effective fight between composition and content, a photo with no winner in this contest. Strong is also a photo putting questions to viewers without giving answers. Strong is a photo on the edge. So I can’t really answer your question because if I could then, for my taste, my photos would be weak..
What about the clichè in street photography. Is really sometimes unavoidable the cliché? Is something from which run away or we can live with it like photographers? If by the term cliché we mean subjects or the usual scenes that we have seen in many photographs before, I would say that almost everything has been photographed. I am very unlikely to be surprised in a photo by a unique subject I have never seen before. It is more likely that one is surprised by a cliché which is being shot in a unique way and this way the photographer succeeds in making it his own. I always remember a quote from Picasso saying that a good artist copies but really great artists steal. So I don’t care if someone shoots a cliché but whether he succeeds in stealing it that is making the shot for ever his own, being original even in a cliché . The street photography: I think this kind of photography allows you to document in a language very close to conceptual art, where the content is more important than the form. But the form seen as aesthetic, also is important when we take a street shot. How important is the aesthetic in street photography? Aesthetic is very important if we take it as a photographer’s signature. Of course without content it is an empty letter. Decisions about form are usually made before shooting. Like Colour or not, contrast or not, crowded or not, time of day that you shoot, the medium that you use. Even after shooting in post processing or editing. But when you shoot in the streets you just have your instinct face to face with reality. Facebook, twitter, flickr: a contemporary photographer can really think of giving up the potential of social networks today? I think the contemporary photographer has to think carefully about how to use social networks today. I mean if he tries to find out if his photo is good or not through social networks, like a popularity contest, he is doing something wrong. Popular is not necessarily a good photo. The proper use of these networks in my opinion is to make your work known to as many as possible. I consider them (the networks) as a big open worldwide exhibition of my work. Of course there is also another advantage, you get to know fellow photographers, make friendships and when you know people their opinions start to matter to you more than hundreds of ‘likes’ from unknown viewers. You are shooting now with a Fujifilm X100 now. What about this camera? And do you think that maybe a way for the future could be represented by the digital rangefinders? You are one of the administrators of SPN project. What do you think of this challenge, now at the second year? I think that it is going very well so far if we consider that the community is self organized and we do not have the backup of a well known gallery or a famous book as we had in the first year. Many of the admins of this second year realize that we have learned a lot from the first year’s project and we have decided to give something back by giving our time, energy and ideas. Many people will probably think that members like the instructions and that is the motive to take part in the project. I think the most important part of the project is the community itself. That inspires people more than the actual instructions. You are the owner of one of the most interesting blogs on the web. I’m talkin’ bout “Beyond Obvious” naturally.Do you think is important for a photographer to circulate ideas and share thoughts through this medium? I don’t only think of it as important I think of it as a debt. I have gained a lot of interesting ideas, thoughts, knowledge, from other photographers either from books or from sites, blogs and forums. I think I should give back some of what I have gained. Art, technology, philosophy, our culture in general has made steps forward by sharing thoughts, ideas and knowledge. So yes I think it is very important to share my thoughts or whatever interests me with readers from all over the world. For me it’s a way of paying back plus it makes me research interesting subjects more in depth and in the end I enjoy it very much. Street Photography is really knowing an explosion of popularity or our eyes are influenced? 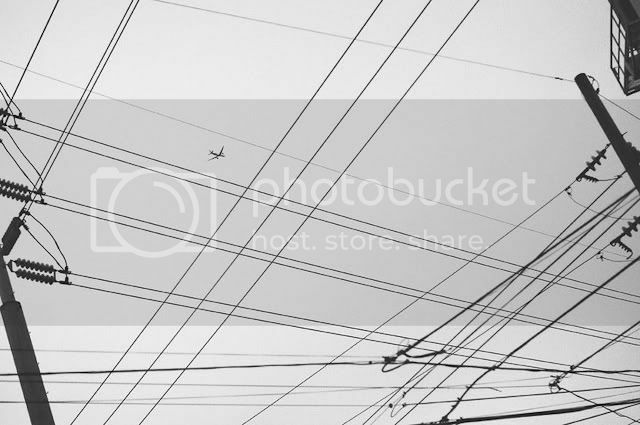 I think Photography is facing an explosion of popularity and therefore street photography is growing aggressively too. I think one of the first steps of any new photographer is to take a camera and walk in the streets. He probably thinks that he is doing street photography. Until he realizes what sp is about and decides whether he really wants to continue or not, he thinks of himself as a street photographer. I think the people who stay in street photography after 1-2 years in the streets are fewer than we think. I see more and more color in the future of this genre. 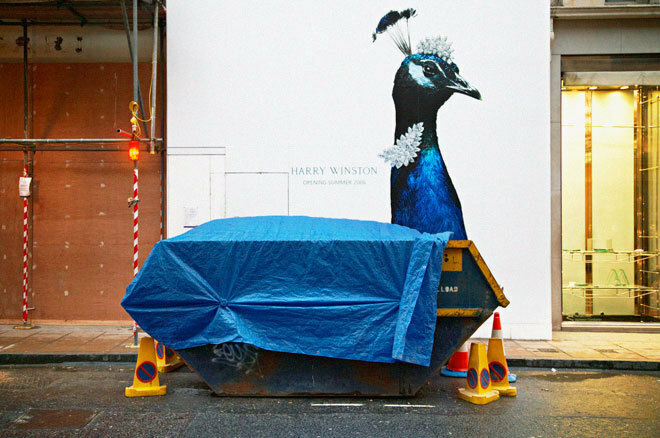 Of course it is something that varies from photographer to photographer, but generally speaking, also by the recent awards (reality remade, street photography awards) there is so much colour street photography. I started with black and white like many of us. Not for sp but in photography generally. Shooting with digital makes it easier for any of us to shoot in colour and have control over it. For a year now most of my latest street shots have been in colour. I think of it as a challenge. At first I found it more difficult but now I find it more interesting. 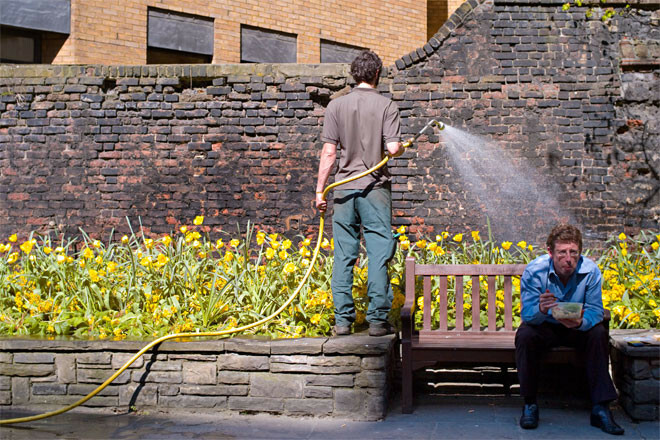 Street photography is about everyday reality. But reality as we know isn’t b&w, it is colour. Photography, street or not, is for me a fight with reality. We must, as photographers, fight reality with the only weapon – reality itself. So if we remove colour it’s a bit like cheating. I decided to play fair in the field of street and only time will tell if it was a good decision or not. Probably these thoughts are common to many of us; that’s why you see so much colour street. Is there anything you’d like to add or you’d like to talk about in this interview? I just want to thank you for your interesting questions. I wish you all the best for your blog which I believe, judging from your energy and passion for street photography, will be one of the great successes of 2012. 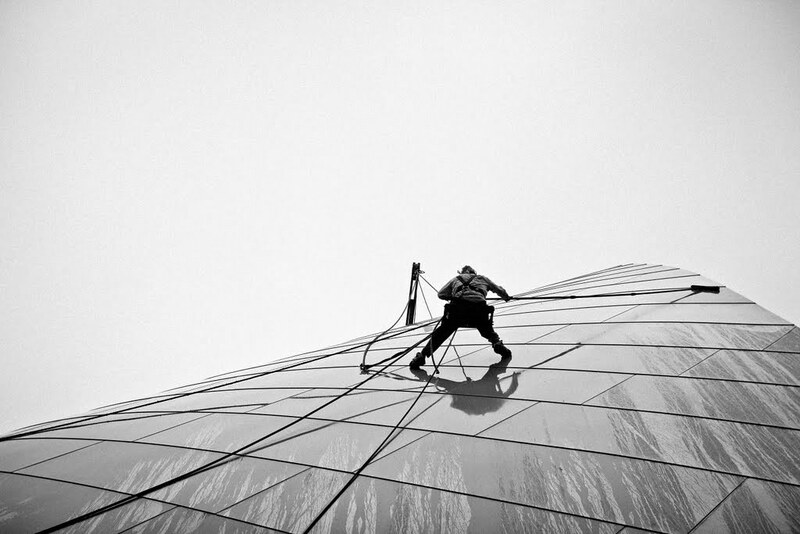 Thanks to you, Andreas, for your inspiring street photography. 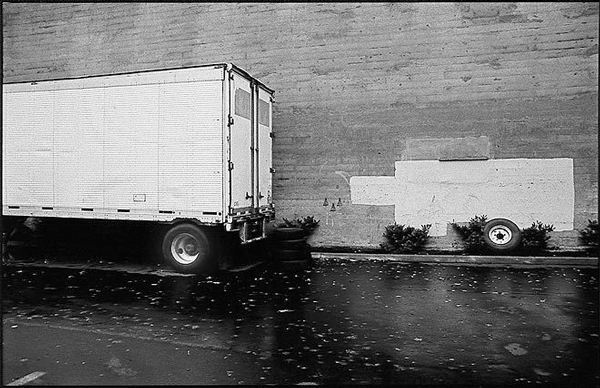 And you, street photographers, can see other works by Andreas Paradise on his website and his flickr. All images courtesy by Andreas Paradise. Ironic reading this quote under the image most famous of Doisneau because he he was forced to admit that it was a set up photo. Baiser de l’Hôtel de Ville, his most famous picture was taken in 1950 and portrayed a couple kissing along the bustling streets of Paris. The identity of the pair was a mystery until 1993, when Denise and Jean–Louis Lavergne denounced the artist photographed them without their will. This took Doisneau to reveal the truth and that is that the photo was a “fake“ because the scene had been built. The two characters were, in fact, the two actors and models Françoise Bornet and Jacques Carteaud. 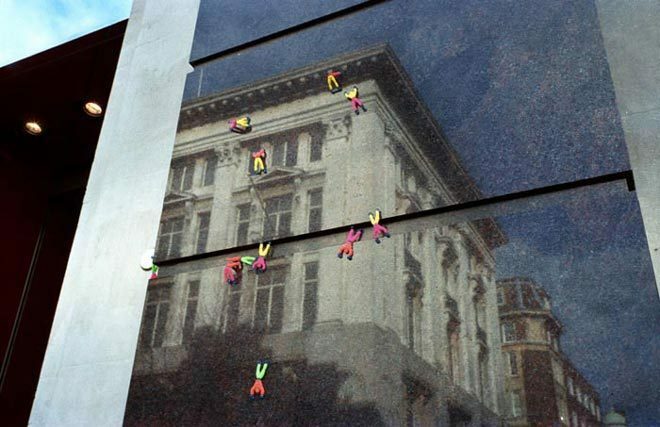 As the pay per click Bornet received very little money and an original print of the photo which in 2005 sold for 155,000 euros. In his defense, however, the photographer admitted that the reconstruction of the scene and the kiss stemmed from previous observations that he had observed near the Hotel de Ville. So it is likely that Doisneau had really seen the kiss between Denise and Jean–Louis in the days before and then decided to reconstruct the setting to be able to capture. It remains a consideration. Times were different and the strength of that image has remained unchanged over time even after the admission of the same photographer. Actually belongs to the icons of street photography. But the question is mandatory: if this case had happened today, If a contemporary street photographer admitted that he built a photograph what would happen? It is not difficult to understand that the photographer would be downgraded, and openly criticized by the majority of critics. So it is undeniable that the opinion changes if we talk about one of the acknowledged masters of the genre. There is no doubt a sort of reference when we speak of the masters, but is it right? Why if someone falsifies the genuineness of a reportagistic photo today is eliminated from a competition and is still celebrated Doisneau? This post definitely does not want to diminish the importance of the master or this image. This photo has candid elements in it (people around) but certainly is different from work of Nacho Lopez that also made use of actors, but in Lopez projects they were to the service of the reactions of the people. With this post i wanna reflect on what we consider to be unethical now when we’re talkin’ about street photography and reportage and this historical image. Today I want to introduce one of my students, who has just finished a workshop with me here in Mexico City. The workshop began and ended in 8 days, had a total of 4 lessons, the last one in the historical center of the city. It was a pleasant day, full of photographic opportunities, and i think that hukes took advantage very positively the day. Despite my student also holds DSLR, he used a Canon G12. This allowed him to be more stealth. This post dedicated to him wants to show some of the images he made ​​during the day. I think that hukes is a photographer with a keen eye like we can see in these images. My workshops are using Skype technology. There are different types of workshops. At the end of the course each student will have a dedicated channel with me and and together we will develop a route of exposure through various Internet channels that I have, like this blog. In this year I will give workshops for a major brand in the world of photography. I keep a compromise with my students and the desire to create a network of street photographers, also in anticipation of the school in Mexico and other projects in which I intend to involve them. A workshop with me so it’s just the beginning, and the possibility for those who want to do something important through street photography. 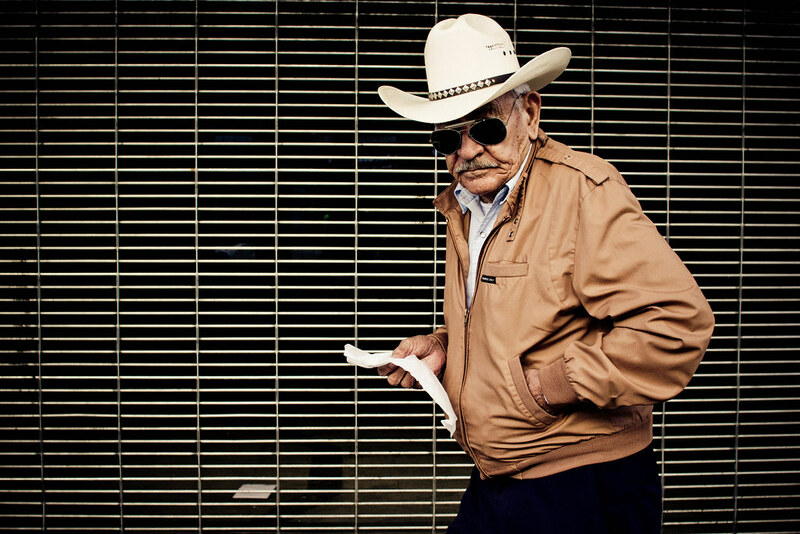 Alex Coghe is currently giving street photography workshops in Italian through skype and for the mexicans in Distrito Federal in downtown of the city. 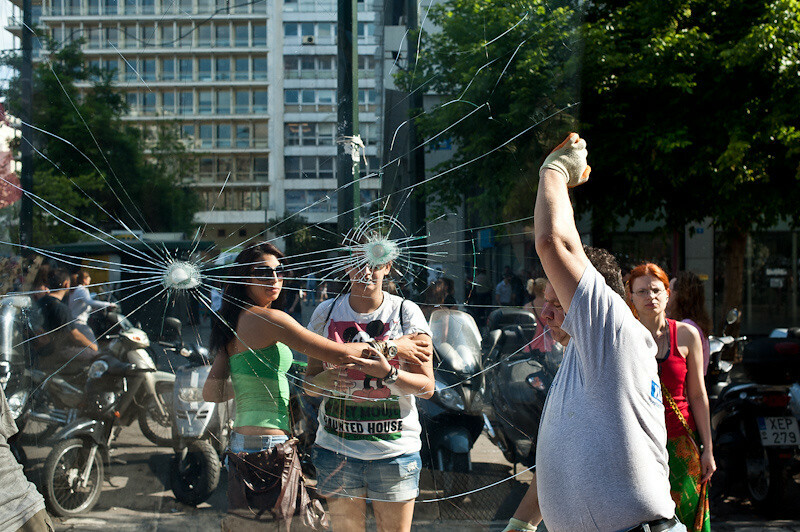 The 2012 project will be the opening of a street photography school that will be also a showroom for artists. Through skype the street photography workshops can be also in spanish language. 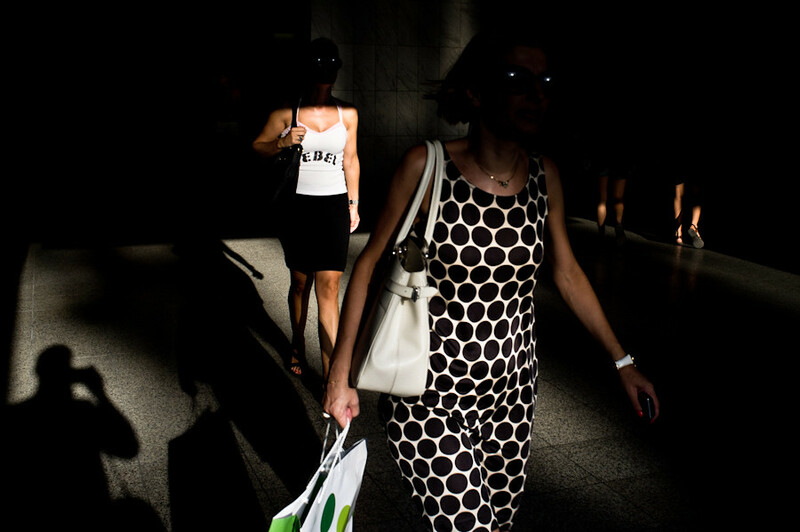 Alex Coghe is also available for private online/offline street photography lessons. Private 1:1 street photography workshops are the ideal solution to acquire and improve the skills on this kind of photography. After months of hard labor, the great dream of Todd Hatakeyama saw the light on December 10, 2011. Located at 905 S. Hill Street in downtown Los Angeles, the site lies near the heart of the L.A. Art Walk in an area that has served as the site of so many memorable urban street photography safaris. Another heart beats strong in Downtown, Los Angeles where culture and art are renewing the Californian city positively. More than anything, I wanted to ask you about the exciting project you’ve just realized: the Hatakeyama Gallery. What are the main activities and objectives of this exhibition space?What difficulties, if any, have you encountered, and what challenges remain? What have you found most satisfying about the project so far? The most gratifying aspect of the gallery, and its primary purpose, is to showcase the work of local photographers who might otherwise never have the opportunity to present their work to the public. Our grand opening exhibition, for example, included street photography by both established names and by rising stars like Rinzi Ruiz. It was great to have all these artists share their work with the 200 or so people who attended. By fostering this kind of cultural outlet, we hope to encourage the ongoing improvement of downtown Los Angeles. The only problem we’ve had so far is installing sufficient lighting for the space without blowing a breaker, but I suppose that’s to be expected from a building with wiring that dates back to the mid 1900’s. You confided to me that the gallery has every intention of becoming an important headquarters for the street photographers in Los Angeles. How will it serve this community of artists? After shooting with some photographers in our downtown L.A. group on several occasions, I realized we needed a place to meet up and hang out. Now, if photographers come to the area to shoot, they can just post a Facebook message, and whoever wants to join them can rendezvous at the studio before heading out to shoot. We have a lounge and a street photography library where everyone can relax after a day out on the streets. We also intend to offer regular workshops and seminars taught by prominent local and visiting street photographers. You have the reputation for being “Mr. 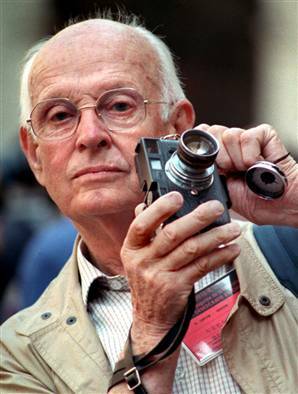 Leica” due to your devotion to the brand. You even have a blog called “Lighting Leica”.Compared to other cameras, what is it about Leica that has won your loyalty? I wouldn’t say I’m Mr. Leica, but I do my best to keep them in business! I’ve been a Canon shooter for years, but I grew tired of carrying so much heavy gear on my vacations and other outings, so I looked to smaller cameras. I tried a D-Lux 4, my first Leica, but it was still a point-and-shoot and didn’t do what I needed at the time, so I sold it. I then found out about the Micro 4/3 cameras and bought an Olympus E-P2. It was a great size to carry all the time and had interchangeable lenses, good low-light performance, but it just never gave any of my photos the “wow” factor. I then started to research the M9, reading all I could from Steve Huff’s blog, various message boards, and anything other info I could find online. I decided to just go for it. You only live once, after all. So I bought the M9 and 35mm Summicron and couldn’t have been happier with the results. But then tragedy struck: my sensor cracked. I had the camera replaced, and the first day out with the replacement camera, I got the sensor fault error. I’m now on my third M9, and (crossed fingers) so far, so good. Even with these problems, I am now a devoted Leica shooter. I have sold off all my Canon gear and picked up an M8 as my backup. I have pretty much all the Leica lenses I want or need, so I think, for the first time in my photography career, I am content with my equipment. Here’s a tricky question. I don’t want to cause any diplomatic conflicts, so you can choose whether or not to answer it. You saw the show “You Are Here” at the Think Tank Gallery. As a neighboring gallery owner, what did you think of the exhibition? I’m happy to answer the question, because the “You Are Here” exhibition was a great experience. I loved not only seeing the results of the week of shooting in one small area of downtown, but talking with my friends who were involved in the process. Focusing on a couple blocks for so many days made the photographers see the streets and the people better, and they really became part of the neighborhood. The Think Tank Gallery was a major role model for me when I chose to move to L.A. and open my gallery. After seeing the exhibit and the gallery space, I was eager to have my own venue for equally inventive and illuminating shows. What are Todd Hatakeyama’s goals for 2012? Among our most exciting goals for 2012 is to become a regular stop on L.A.’s Downtown Art Walk. The Art Walk has become a vibrant event in the city’s cultural life and has contributed greatly to the downtown renaissance, and we look forward to being part of it. Workshops! Upcoming workshops include Steve Huff and Jordan Dunn, in the planning stages is a street photography workshop with Bellamy Hunt and Rinzi Ruiz. We’re also looking forward to fashion photographer Sean Armenta in the near future. We would also like to feature solo exhibits from major street and fashion photographers. In addition to the Hatakeyama Gallery, my downtown L.A. facility offers a 3000-square-foot studio with three cyclorama walls that we rent for photo and video shoots. I’m hoping to make it a preeminent studio for local photographers and videographers. I’m also manufacturing some products geared towards the Leica crowd, as well as for Micro 4/3, Fuji, Sony, and Nikon mirrorless cameras. And, oh, yes—if that isn’t enough to keep me busy for the rest of 2012…I’d also like to take some pictures! I have a trip planned this Spring to Germany, France, Belgium and Ireland and I just signed up for Art Wolfe’s workshop in Washington’s Olympic Peninsula. For this and, indeed, every year, my foremost goal is always to become a better photographer. Johnny Stiletto. 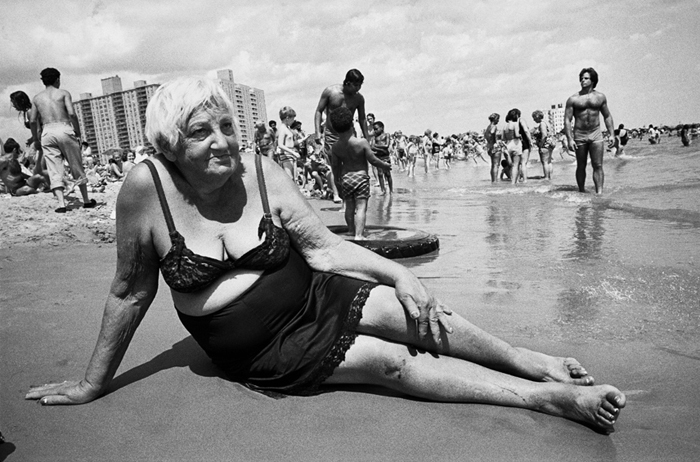 Well known for his intimate, socially revealing black and white street shots. 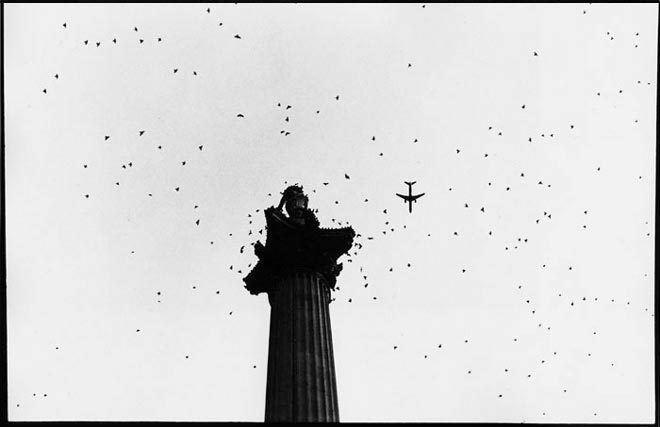 A collection of his photographs is in the Tate Gallery, London. His TV work includes documentaries and commercials. Stiletto’s photograph of Francis Bacon on the London Underground was reputedly Bacon’s favourite photograph of himself. 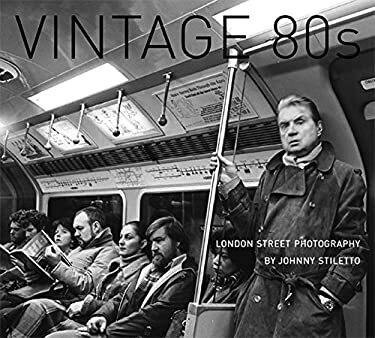 “Buy a 35mm camera at the beginning of 1980 and spend the next 10 years walking around London taking half a roll of black and white a day and photograph whatever happens in front of you.” This was the plan of this photographer and the result is collected in this book. You get Mick Jagger, New Romantics, Ra Ra skirts, Boy George, Sloane Rangers. The beginning of Covent Garden, Yuppies, The IRA bombings, the Iranian Embassy siege. 100s of newspaper flyers – John Lennon Shot Dead – Margaret Thatcher’s London, Fashions that came and went. Here are 160 unique street photographs of London when it was the style, musical, political and fashion capital of the world. “London Calling” with this fantastic book. 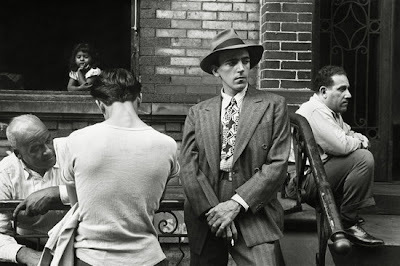 For me this photographer has realized an important project as he did before him Robert Frank documenting the Americans. There is in fact a complete immersion of the author in the documentation of an era for London and this you can do if you’re completely involved. The result is a faithful portrait of a city, that should be an inspiration to all the street photographers. 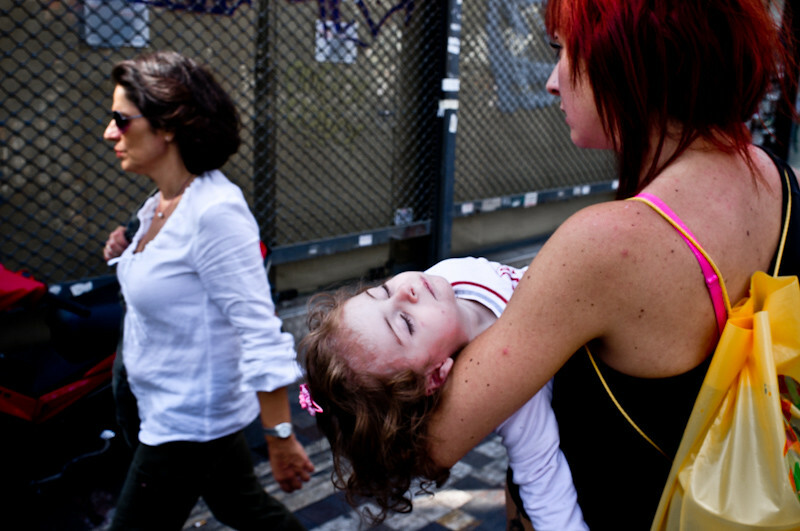 This is street photography with a strong documentary value. As I said in another post, it’s time to stop talking and refer only to Bresson and Doisneau when comes street photography. This would be like talking about rock music pretended to speak only of the Beatles and Rolling Stones forgetting all that came after (Black Sabbath,U2, Queen, Guns ‘n’ Roses…). Check out his website. There is a lot of inspiring suggestive work. Photographers Rights can help photographers to understand their legal rights in different countries, providing practical help such as asking common questions in different languages using your iPhone speaker to pronounce them, with a native voice, common questions for photographers. Every country has different laws regarding photography, copyright and contracts with individuals. Maybe in your country it’s totally legal to take a picture of a building but it could be illegal in another one. Maybe a police agent approaches you telling that you cannot take a picture and you don’t really know if the agent is right or not. With Photographers Rights, you will have always a simple and quick legal reference that will help you decide about your actions, as a photographer in different countries. Photographers Rights also provides a quick list of common phrases in different languages, but you don’t have to read them, the application will speak for you in the country native language of your choice. It also provides common used contracts in different languages, that you can send to yourself by email. 1. Legal rules for USA, Australia, Canada, UK, Japan, Spain, Italy, France. 2. Your legal rights, valid for every of the supported countries. 3. General copyright laws, common to the supported countries. 4. Privacy laws, common to the supported countries. 5. Contracts in different languages, valid on the corresponding language spoken countries. 1. Working on translation into Japanese. 2. Audio recording useful for legal proof in case of a trial. What distinguishes the street photography, even before of the type of “person“ represented, are the elements that evoke is a very specific “mindset“ of the photographer, its setting, its programming, its susceptibility to interpret the reality, the world around him. 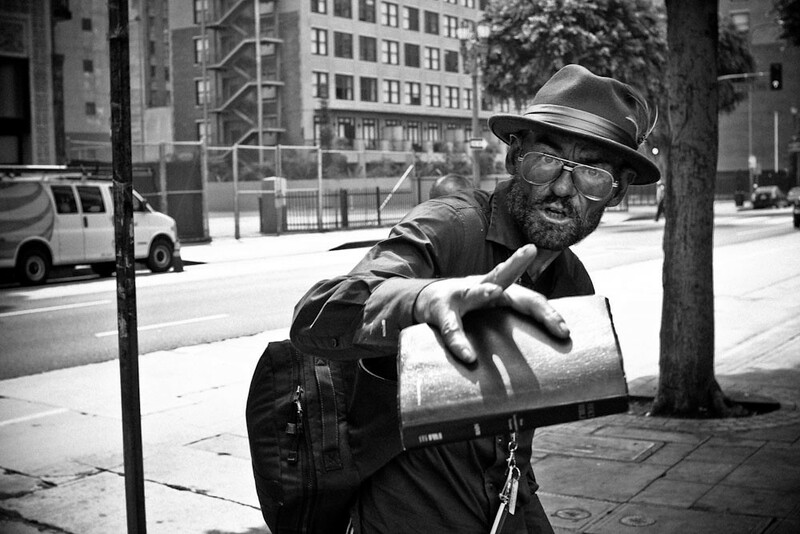 The street photographer must be able to reinterpret the reality that he’s living. Through a composition, a particular cut, through its eye the street photographer contextualises the reality, plays with it, giving back something significant in photography, so that the observer is not located in front of a normal scene, but sees it as a surprise, an unusual appearance, able to transmit content. 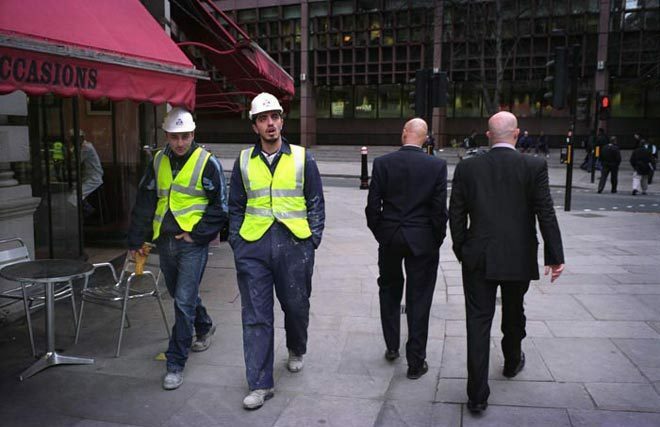 When we think of street photography we normally consider images with people. But street photography can also be free of human subjects. This premise has a duty to present the street without humans. Well, in this image the master Henrti Cartier-Bresson shows perfectly a story without show us humans.The presence of human is only evoked. A simple bicycle parked would not be street photography. But in this case the choice to park in the middle of the breast of a woman tells a story, even ironic. So, this is a street photography. Here a perfect example of reinterpretion of reality. We are seeing a piece of cardboard, but undoubtedly with a human expression. This picture is another example of re–contextualization of reality. 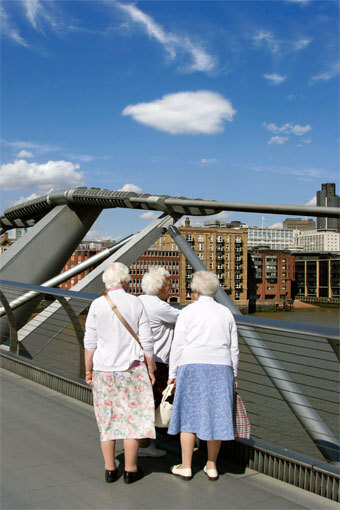 During normal walking, the author focuses his attention on certain elements. 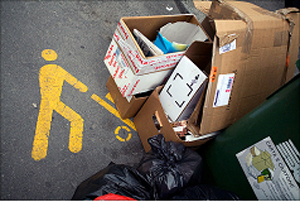 Looking down, select a specific road sign of “loading and unloading” painted in yellow on the asphalt, a symbol that reminds humans and his actions. Part of the sign is covered with cardboard boxes, which are randomly drawn on whether the sign of the upright stylized. The author packs his frame choosing these few items, organizing them in frame with the aid of a specific frame and capable of making them self-sufficient in themselves to support the interpretation of the whole scene tasty, without the need for a title. Another re–structuring of visual perception. The fundamental concept of reframing indicates the re-contextualization of reality, ie the set of selection, organization and interpretation of the visual perception of stimuli. The restructuring of reality is a common practice especially in the medical and psychotherapy. The reframing is therefore to change the framework within which a person perceives a particular reality. Some elements of it are re-organized in order to change the meaning of events and of reality itself, as in a sort of sleight of hand: when the meaning changes, reactions and behaviors of people change too. But if this idea is simple, practice is another matter. There is no doubt that this gift helps make sense of their shots and originality in all photographic genres, but it certainly is a key element in street photography. We, however, the world seems far more orderly and understandable and clicks follow the same criterion proposed order, were selected because this precise visual input. But because those elements have been selected and not others? Simply because the authors have a particular “mindset” had their “idea”, they thought interesting, and then in reality they sought to represent. It is clear that the reinterpretation is a fundamental part of street photography. 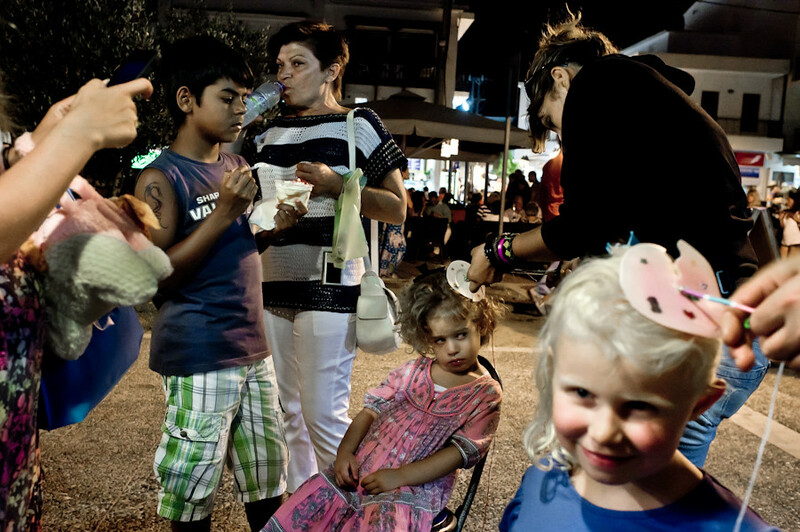 The street photographer observes, organizes, deconstructs and reconstructs. The interpretation is the key and this is one reason that differs street photography from some conventional documentary photography. Where the reportage is meant to represent reality or a part of reality (yes, we’re talkin always of a subjective reality) street photography aims to a particular interpretation, many times completely different from the objective truth. And where the strength of the author recites a very important role. 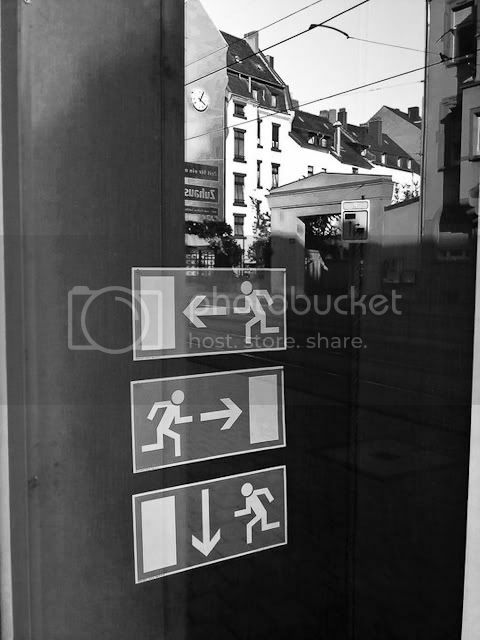 the “street photography” message can get immediately, while others need more time to absorb the content in the reading keydesired by the author. 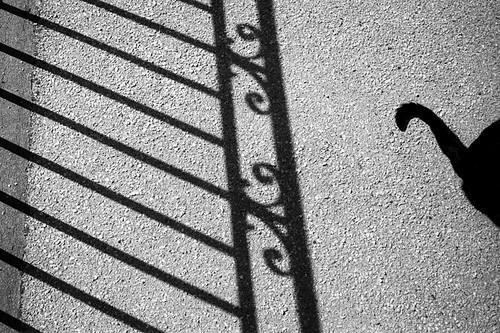 Photos of inanimate objects or animals really need something extra to get out of self-reference, the didactic, the danger of representing in a banal and simplistic an objective fact of reality. Wherever you can look and actually -feel- man’s presence even in his absence, it is considered street photography.It could be a bizzarre association, an unconventional moment that’s happening in the streets, a totally different reading of a subject. The street photographer is always ready to capture special moments and situations in the street, and this is independent of human presence. We can do a lot of ruminations on street photography, but in the end the photos that strike more attention and remain impressed in our memory are those in which the unusual, the thing that you do not expect, or completely surreal emerges. This post is intended as a visual guide through great street photography images taken by some of major street photographers. Like street photographers we have the duty to seek the unusual. I hope that this visual guide can be inspiring for you. 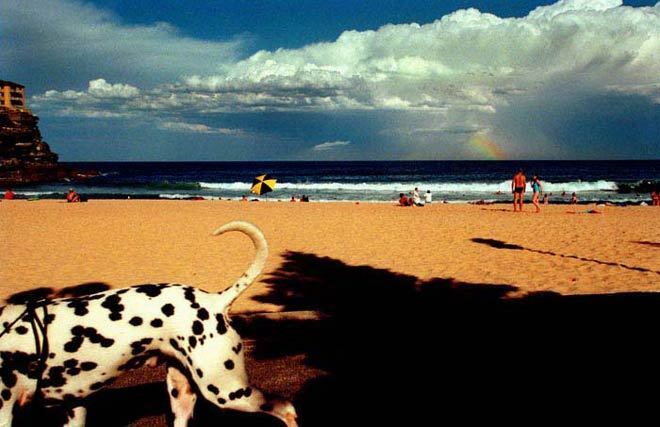 The protagonists of today’s post are the plumbee moods of Trent Parke, Australian photographer born in Newcastle, Australia in 1971. Trent Parke has an unbelievable curriculum: joined Magnum Photos in 2002 and became a Member in 2007, he is also member of In Public. Using his mother’s Pentax Spotmatic and the family laundry as a darkroom, he began taking pictures when he was around 12 years old. 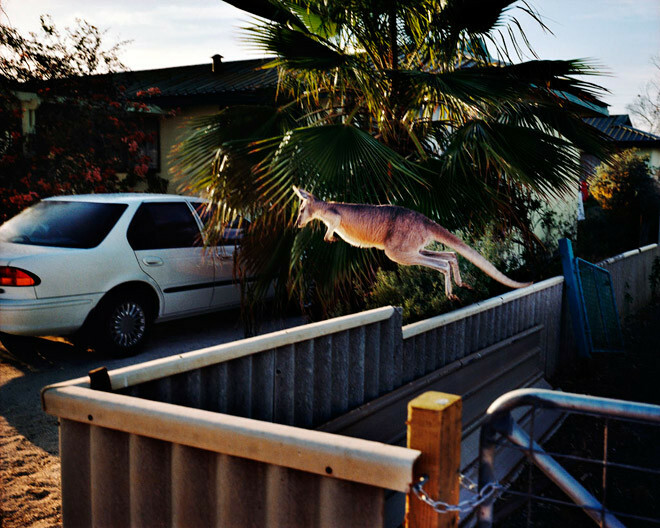 Today, Parke, is the only Australian photographer to be represented by Magnum and works primarily as a street photographer. 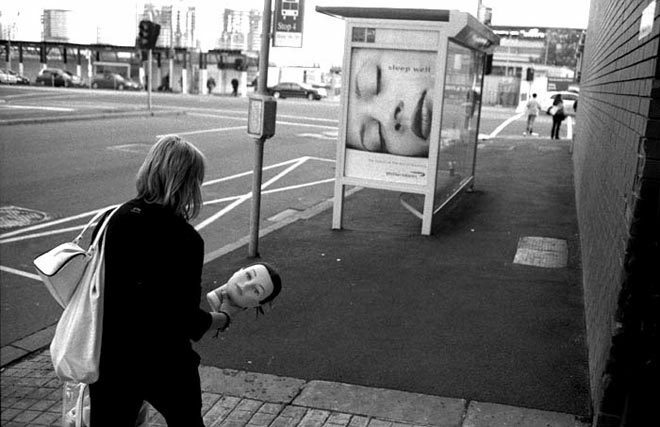 His street photography has a dark mood. Especially its black and white images are pervaded by a gothic lyricism, with claustrophobic atmospheres like those strange dreams, one step away from the nightmare, from which you would like to wake up. The contrasts are sharp, the blacks closed, so the sunny light comes to add tension and drama. For the stories evoked by this photographer I associate with that proposed by Daido Moriyama, of course, with the due differences. A major difficulty for those who make street photography is overcome the fear of photographing strangers. It is also one of the hardest things to explain in my workshops, because the words you can also try to calm the photographer in front of what is a real psychological block but when we’ re on the streets then they have to begin to be more daring. 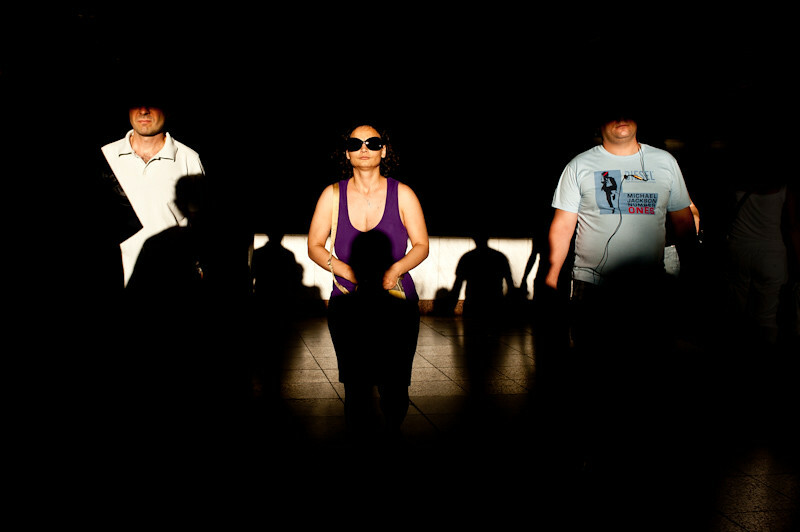 So what are the psychological reasons for this fear of photographing strangers? Let’s start by saying that human beings are protective and defensive by nature and that many times this psychological wall starts right by the photographer. In fact there are many photographers who do not like being photographed. The problem becomes chronic if the photographer is convinced that the act of photographing strangers on the street is wrong, as an illegal act. This as we have mentioned in a previous post on this blog is equivalent to assume an improper body language and this attracts suspicion. 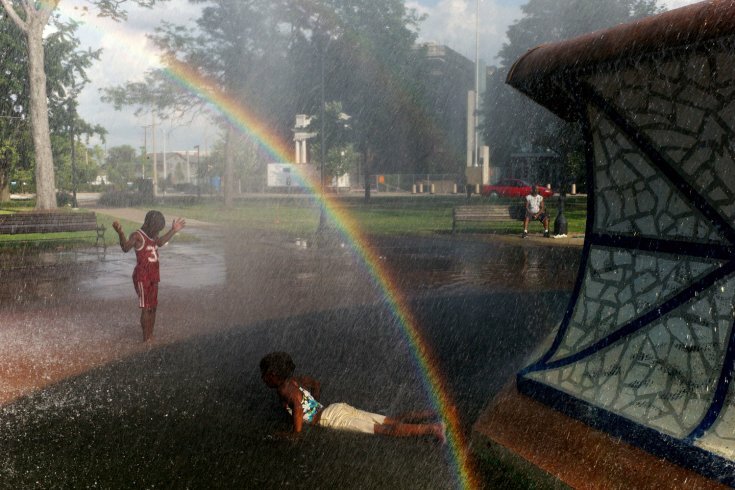 The peace of mind of knowing that photography in public places is a normal act and nothing illegal is essential. If someone feels their own personal space is being violated they most probably are going to react. This is a realistic assumption to consider, but we must not be frightened by this. Certainly taking a picture of a person is entering the intimate sphere of the subject: this is important to keep in mind also to ponder our risks on the streets. But pointing a camera at a person is not pointing a gun. 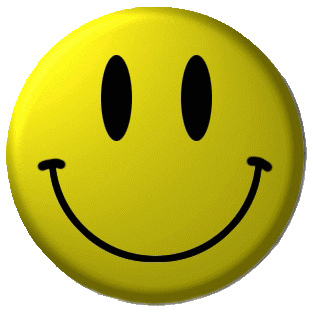 Most people do not react badly if we smile and a friendly approach. I now often use the flash and 95% percent of times i receive smiles and amiable conversation with the subjects of my photos. Approaching a stranger on the street can be intimidating at first.But this should not make you desist from your purpose of practicing this type of photography to return to take pictures of landscapes and your dog. Have real interest in your subjects: if you are sincere in you interest, you’ll be more sure of yourself and do best photos. And do not be timid. If someone asks you why you have photographed him, explains the real reason for your shot. Using the benefit of the digital technology , yes the LCD of your camera to show your subject the images you’ve captured of them can help you. Better select the option black and white if your camera allows this: to see the images in black & white relaxes most people who think you’re doing artistic photos. And remember that if it is normal to start timidly if you keep to take photographs with fear after a while, never pass to another level. The pictures with people from behind or too far away subjects often do not work. And then it will be the same desire to get that picture that you will have more courage and forget the fear. The interview today is with Jordan Dunn. I have known Jordan, during the “You Are Here” in Los Angeles to which we both participated. Jordan then won the show, and to me has happened to know him a little better two days after the evening show, when returned to the Think Tank Gallery I found that tinkered with a Leica, the prize. 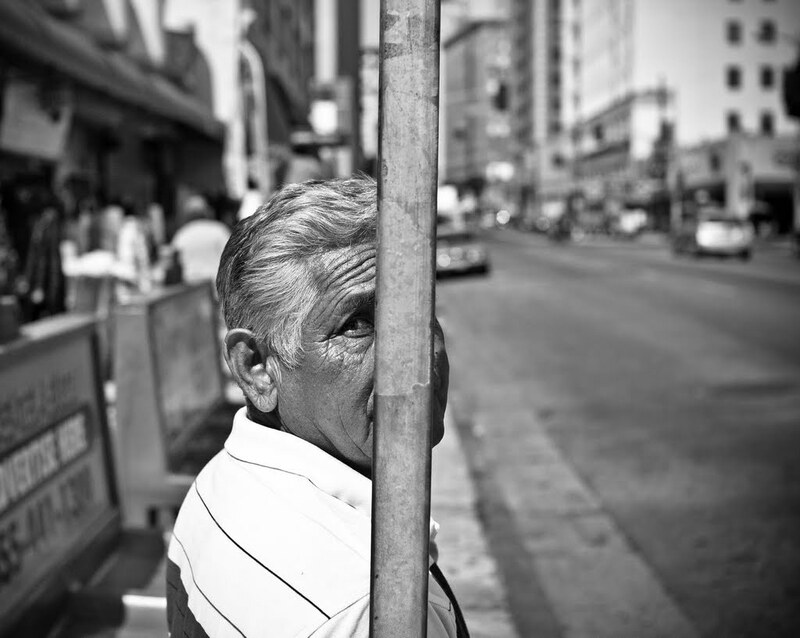 Hello, my name is Jordan Dunn, I shoot street photography primarily in Los Angeles. I have been interested in photography since I was about 15, but really got into when I saved enough for my first dslr. I grew up in a suburb of LA so I have always been close. I have been exploring more of LA in the past year. You are not focused principally on street photography, is that right? This did not prevented your winning the competition “You are Here” in Los Angeles. Feelings about the event? That would be correct, I enjoy other styles of photography, however I find street photography is still my preferred style. One reason for this is you can practice it anywhere you go. As far as the “You are Here” event goes, I have to say, getting chosen to participate with so many great photographers really forced me to produce good images. The experience was great, I got to meet many photographers, including yourself, that share the same passion for photography. Also, taking home a Leica camera was nice too. Well I shoot street almost exclusively at 50mm, I like to focus on a subject(s) that can engage the viewer of the photo. During the you are here event my goal was capture emotion, this is something I have carried onto my other photos and style. I found Los Angeles an ideal city for street photography a lot more than what I expected. What do you think? I do think its a great city for street photography, so diverse and so much culture is created here, why not document it? 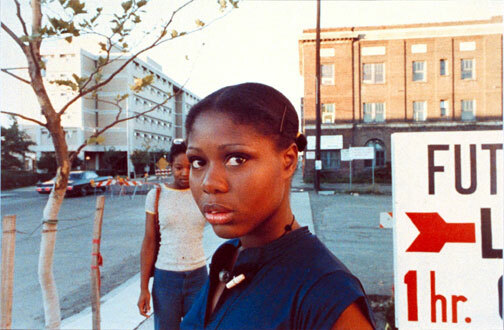 When you photograph in the streets, do you have a theme in mind? Not always, but I look for a moment in time, I love capturing a shot of something that is fleeting, or a slice of life if you will. Not a theme, but compelling, those are my favorite shots. What kind of impression do you hope to leave upon other’s who see your photographs? Hope… well I hope they would get some semblance of enjoyment from seeing it. If not, then I don’t mind. Regardless of ambition we all have detractors in our life. You are giving workshops. What is the most interesting aspect of teaching photography? Meeting other photographers that I can help, influence or inspire. I think it will continue to grow in popularity as more micro 4/3s cameras deliver DLSR quality photos at a lower entry point. Social media will also drive the popularity. Companies are throwing their support behind it as well, At CES this year, micro 4/3s were everywhere, every company has a DSLR competitor. Small, quality cameras will be the driving force to bring street photography to the masses. And Jordan Dunn? Where he will go in the future? Travel more, shoot more, and teach more. The future looks bright. All images courtesy by Jordan Dunn. You can check out more by Jordan on his website, his blog and flickr.